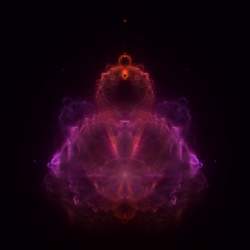 I've been experimenting with rotated mandelboxes lately (especially negatively scaled boxes) and I was wondering what formulas tend to work best for bringing out waves, spirals, etc? I've been having better results with scalings between -1.3 and -2, with lower rotation numbers (-30 to 30 or so). I tend to get more waves and mushroom-like shapes in the surface distortions with those numbers, but have yet to pull any good spirals or other shapes/textures out of them. What kinds of formulas do you like to work with for best results? Try scale from range -1.2 to -1.1 and lower rotation angles (between 1 and 5 degrees). For good effects you need high zooms. Until now I probably haven't helped you a whole lot, so I'll stop rambling and tell you where I like to explore. First, my mandelboxes tend to have a scale between -1 and -1.3. I do try lower values from time to time, but I find myself ending up in this range most of the time. They seem to have a more "organic" feel in this range, and that's something I like. I would call the rotations you mention large. I do occasionally use a rotation of +/- 30 degrees around max one axis, but in most cases I keep |_rotate| < 20 °. These values alone give you a good starting point. Then it's time to explore. Sometimes you'll have to zoom in pretty deep before you find something, and since there are lots of areas to zoom into, you do need some patience... Especially if you go closer to -1, rendering takes longer, because you have to increase the maximum number of iterations. P.S: Just saw that while I was typing, Buddhi already posted a reply, which says the same in a lot less words. I'm gonna post this one anyway, since it took me long enough to write it! Agreed with what has been said by Buddhi and Madman. In fact spirals can be everywhere, like in this animation that you probably have seen already, and where you can see the whole cube in the middle of the video. Spirals are often hidden deep in a little outgrowth or at the edge of a large outgrowth. If you're using M3D I would also advise to use AboxVaryScale instead of Amazing Box, because it offers more parameters to tweak. Sometimes the global shape looks very very weird, but when you explore it carefully you can find little wonders. Wow! I appreciate all the responses. I do have a question, tho. I don't have AboxVaryScale, IdesFormula, or _Flips. Are they in the latest version of M3D? I haven't installed it yet because I have a long-term animation render in progress and Jesse said something about colors being interpreted differently in the new version. Anyway, again, thanks very much! I really appreciate it, and look forward to sharing an image or two soon. Incredible images and shapes found in these rotboxes ! I agree with all above advice, low negative scales between -1 and -2, low min R , not too high rotation values, and just to add that tweaking the "fold " parameter has a lot of effect. I'm finding many strange shapes with fold around 1.00n . (for example 1.005 , 1.003 ). Also interesting is adding the translate formula on a third tab in the hybridation.